When consumers decide they’re in need of, or curious about, a product or service they intuitively head to a search engine. Trillions of Google searches happen every year. Search engine optimization (SEO) can help increase the ranking of your site without spending money, but search engines often enhance and alter their ranking criteria, making it difficult to maintain your rankings. So how else can you promote your brand, drive new visitors to your site and increase site traffic? With search engine marketing (SEM). It’s the yin to SEO’s yang. While not free, it is a great low cost solution to help you enhance your brand’s profile and connect with customers at the right moment. And it’s something anybody can do on their own. SEM is the practice of marketing through paid advertisements that appear on relevant search engine results pages and websites. These ads can have different formats and are paid for through a bidding process. Think of it this way, before the internet, popcorn ads weren’t everywhere. People saw physical ads for the snack in the movie theater, when they were hungry and thinking about getting something to eat. The ads were provided where people were, when they wanted food, and where they had access to buy popcorn. SEM does this on the internet. Your ads won’t be just anywhere, they’ll be placed in front of people who are considering your type of product or service, who live near your company and who want to buy what you sell. You can even choose which search engines to use and where/when you want your ads displayed so that you can best reach your audience using your style of advertising. Let’s start with an example. Say your potential customer needs some writing done. When they search, Google will display results and ads from businesses that are relevant to the query phrase. 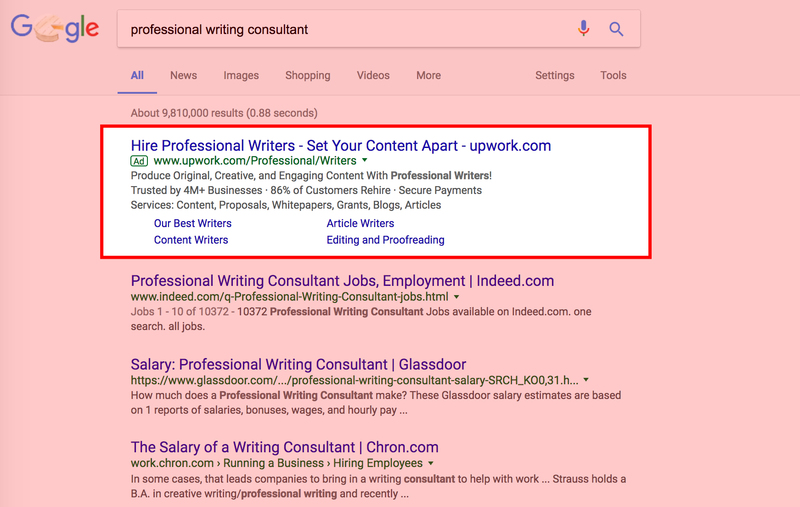 Professional writers advertising their services, are able to extend the reach of their online brand and appear right in front of the eyes of people searching for their services. This is something that isn’t as easily achievable with simply implementing a SEO strategy. Display ads aren’t found in search results, instead they can be seen on websites and mobile apps and can feature interactive formats of images, videos or even animations to engage the user. You can choose to be strategic too, putting your message only in front of the people who are most likely to be your potential customers. This is done by customizing your ad placements to a specific geographic location or when someone is watching a related video on YouTube, or browsing the web in a specific language. There are many display advertising platforms that you can use, with Google Display Network being the largest one; Google claims that their display network sites reach over 90% of Internet users worldwide. This depends on your budget and how you want to use SEM to work for you. You can mix and match different SEM strategies to make the best out of your advertising budget. If the goal is awareness and you may just be interested in people seeing your ad, then you want to focus on cost per impression (CPM). If you’re priority is website traffic, cost per click (CPC) could be the best metric. If your goal is to increase lead calls or transactions, then you can use cost per acquisition (CPA) to optimize the campaign based on actual conversions. CPC is the most popular metric used for SEM bidding. The average CPC in Google AdWords is between $1 to $2 on the search network. The average CPC on the Display Network is under $1. Anyone. Access to SEM tools is usually free and search engines provide tools to easily setup and manage ads right from your computer. Google has AdWords, Bing has AdCenter, and Yahoo! has its Yahoo! Advertising too. Third party platforms can also be used to manage ads in more than one publisher. You simply pay for the viewed and clicked advertisements, based on how you setup the process (which this industry calls a “campaign”).